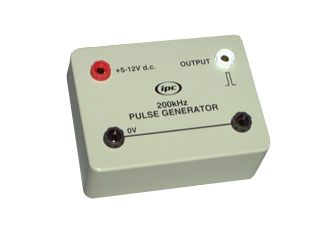 This apparatus (IPC-4900-W) generates a train of positive going pulses at approximately 200kHz. When used in conjunction with a 50-200m length of coaxial cable and a suitable oscilloscope, this unit can be used to show how electrical pulses are propagated along a transmission line. It can also be used to demonstrate the way that signals are reflected at cable ends, and to experimentally calculate the speed at which electrical signals travel. Connection to the unit is made via two pairs of sockets mounted on the front panel. One pair allows connection of the power supply, the other pair being the pulse output. The unit is internally protected against incorrect power supply polarity. For ease of use, the unit starts generating pulses as soon as the power supply is connected and switched on. Housed in a robust ABS case fitted with anti-slip feet on the base. Supplied with instructions but without power supply or coaxial cable.